Reading is a wonderful gift with no shortage of scientific benefits. It’s no surprise that we as parents get so excited about teaching our children to read. But it’s unfortunate that the excitement for teaching a child to read is so often coupled with frustration. We could avoid this altogether by waiting until a child was 5 or 6 to even start teaching a child to read. I strongly considered this option when my oldest was a baby after I read Beyond the Sling by Mayim Bialik. She recounts and promotes the idea that introducing younger children to the alphabet and early reading isn’t beneficial and probably harmful. She shuns any ABC books or posters, doesn’t teach the alphabet song, and expressly works against her children learning the ABCs. While I appreciate the sentiment of delaying formal education until a child is ready, once my own daughter turned 2 it became very clear to me that she was hungry for knowledge and actively seeking it out. I jumped right in with her and began All About Reading Pre-Reading when she was 2.5. She was mature for her age, loved “doing school,” and I couldn’t see why we should wait. Trying to teach a 2 or 3 year old is not an easy task. It’s like something gets lost in translation. And it’s because a child under 6 is indeed NOT ready for formal lessons. So how do we balance a preschooler’s desire for knowledge, a parent’s excitement for teaching, and the physiological fact that the child’s brain isn’t ready for formal lessons? Right around the time I started trying to teach my 2.5 year old to read, I discovered Charlotte Mason. I read For the Children’s Sake, and my life was forever changed. It’s a book about what an education can be when it’s extended outside the four walls of a classroom. We want to give our children the best education, but most traditional educators have lost sight of the joy of learning. Charlotte Mason proposes a rich, broad education. A Charlotte Mason education is based on the idea that education is an atmosphere, a discipline, a life. Needless to say, we never finished All About Reading. We took a break to “say yes” to real life learning and spend our days outdoors. My daughter’s quest for knowledge didn’t end even though we quit our reading lessons. She learned the letters of the alphabet and how to write them by the time she was 3. She could even put words together. 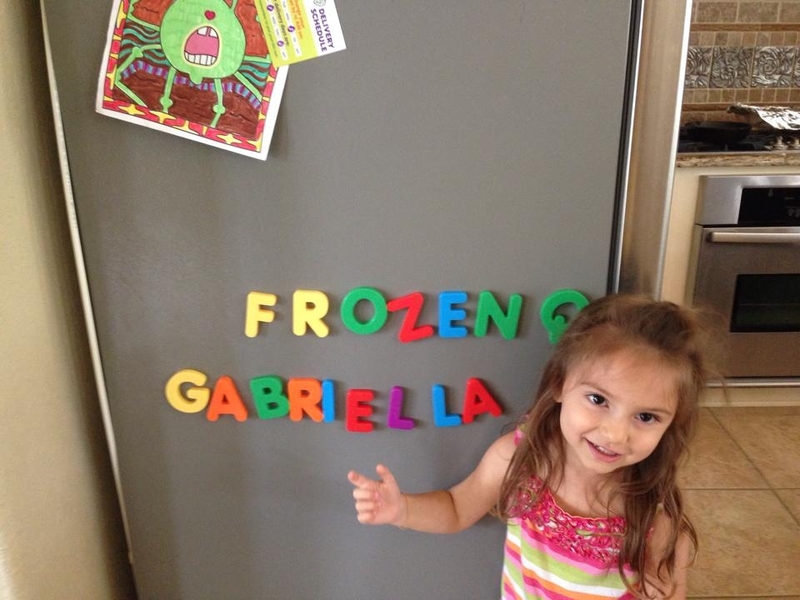 I’ll never forget when she copied this word from our Frozen DVD just before her third birthday. I didn’t know much about Charlotte Mason at the time, but what I did know resonated with me. A Charlotte Mason education delays formal lessons until a child is 6 years old. What’s happening during the first six years? During the first six years, we’re not shielding them from education or the ABCs. In fact, its quite the opposite. By spending our days outdoors making discoveries with all of the five senses, children are developing the skills that will serve them well in their education. Children under 6 begin making observations. They ask constant questions and make hypotheses. Even as babies they are interested in cause and effect. 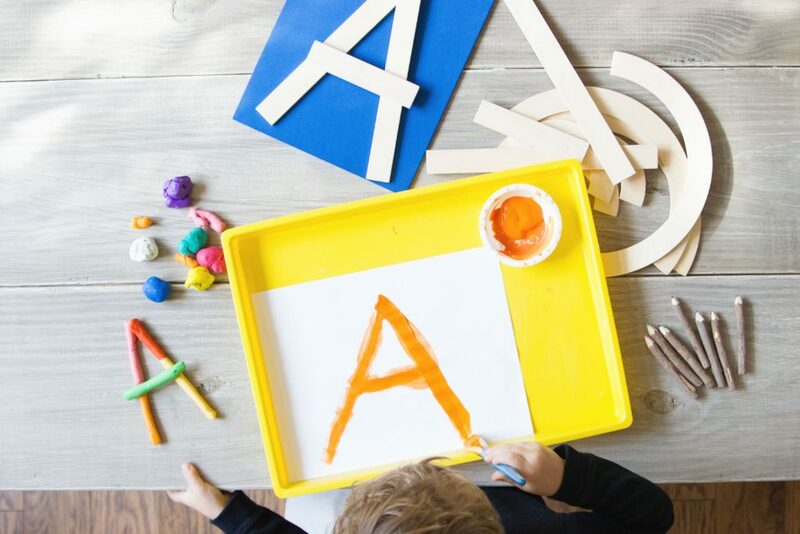 While it’s important to note that a Charlotte Mason education is not child-led, during the first six years, we are following the child’s interests. When a child asks questions or is curious about something he notices, we would be wise to follow that spark as long as it is considered play by the child. It’s unfortunate I can’t go back and have a do-over with my oldest. I look back, and I’m sorry for struggling with her on things that shouldn’t even have been on the table for a 2, 3, 4, and 5 year old. While I can’t go back in time with my oldest, I do have the opportunity to do things differently with my younger two. I want to share how we approach teaching reading in our homeschool, but I want to preface this with a disclaimer. I am only an expert on my own family, and this is what works for us. My method is based on what I know from reading Charlotte Mason’s original writings and written narrations by others. I am constantly learning so what I am doing today may not be what I do next year. I encourage you to do your own research and find what works for you. Teaching the alphabet is an exciting time for us as parents and our little learners. Charlotte Mason knew this and gives us encouragement. The key to teaching the alphabet to little ones is that it has to be play. Learning the names of letters and sounds they make should be initiated by the child. It should be a game, which means it should be fun and lighthearted. The instant the child’s attention floats elsewhere, the child must be released to do his own work. Letters are everywhere. Even our infants’ curiosity may be sparked by letters when given the chance. So what is a box of letters? We have uppercase and lowercase refrigerator magnets that I start using as soon as my babies are past the stage of putting things in their mouths. I would love a wooden set, but we already had these on hand. A movable alphabet is another great option, though it’s a bit of an investment. I found this DIY version at Michaels for under $10. I painted the unfinished wood letters and voila! Offer the box of letters as a plaything, and it won’t be long before a child of 2 or 3 starts asking questions. When the child shows interest, the game begins. I currently have a 3 year old who is very interested in learning his letters. I started with the letters in his name, and let him pick each time we start a new letter. We don’t get hung up on alphabetical order or learning in order of his name. 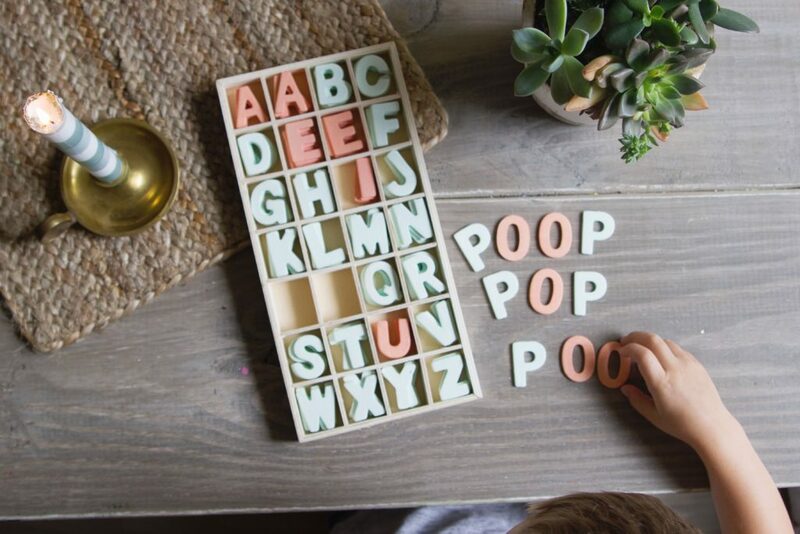 We’ll learn all of the letters eventually, and then the order will come easily. I use the picture word cards from The Peaceful Press showing the uppercase and lowercase letter. Then I show a word that starts with the letter. If I didn’t have this book, I would definitely be saying “puh!” There are probably other great resources out there for acquiring this knowledge, but I am just using what I have. If you have a suggestion, please post it in the comments. Obviously some letters make more than one sound. At this stage, we focus on the sound a letter makes at the beginning of a word. This can be a game where you mix in 5-6 additional letters with the correct letter and let the child choose. As your child becomes more familiar with the letter, you can make it more challenging by increasing the pool of letters to choose from. 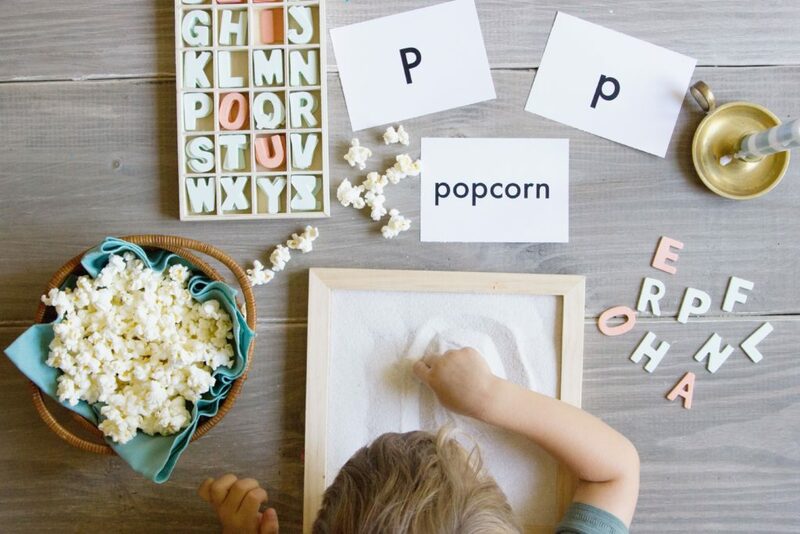 You can also use sandpaper letters, banangrams, or any other tactile manipulative here. I like to keep it simple but it’s nice to have variety to keep everything fun and lighthearted. Use words your child knows. Names, places, and favorite toys or foods are great options. Our little ones need to make connections to know that the sounds a letter makes is related to a word and familiarity helps this step a lot. Some children may pick up a writing utensil and begin writing on their own. That is absolutely ok, but at this stage writing with a pencil and paper is not required or encouraged. I use Handwriting Without Tears for me, not the child, for letter formation and proper strokes. We start with capital letters, and write the letters in the air. Then we write the letters in sand. Next we use our wooden letter pieces to form the letters. If there’s interest, we might form the letter out of play dough or clay or use a big paint brush to paint the letter. Lowercase letters can be more challenging to visualize in the air. Here, we start with writing in the sand. We use our wooden letter pieces to form the letters. And then we can write in the air. 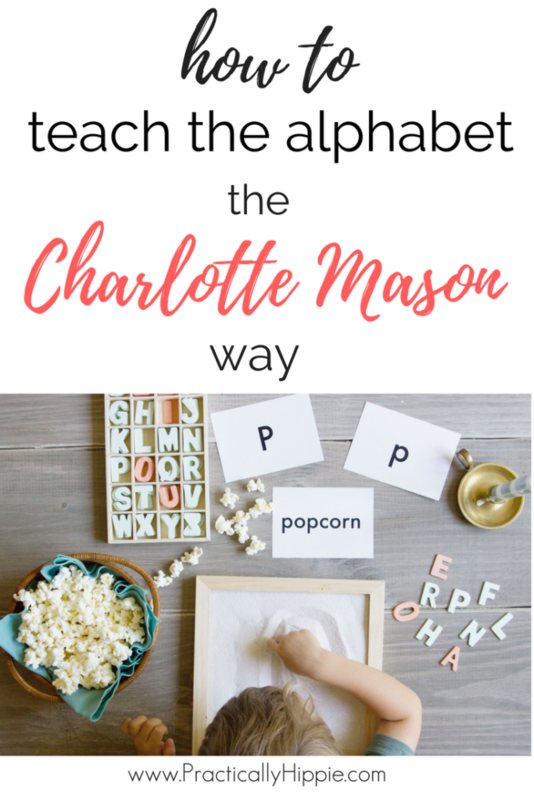 Teaching the alphabet the Charlotte Mason way is short and sweet with a lesson on one letter spanning many days or weeks depending on the child’s interest. What’s missing from these essential letter lessons is the hallmark of most preschool programs. No, we won’t be dressing up like pirates or making pumpkin pie or popsicles. We’re not racing to the library for every book on pigs or pears or characters named Peter. We won’t practice counting with peas or have a paint party. Purple isn’t the color of the week. Did you hear me? 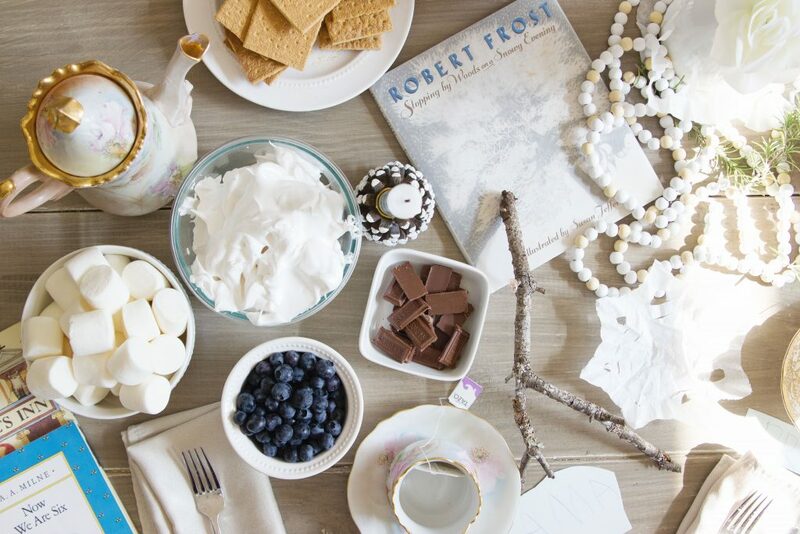 You don’t need cutesy crafts. No special snacks. Themed read alouds aren’t required. No corresponding math or art or science or history or anything else. Whew. Doesn’t that take a load off your shoulders? I know it does for me. Part of parenting during the younger years is knowing that we are doing enough just by living life. We do not need to do all.the.things. We already do poetry teatime and spend hours outside each day. We sing songs and read poems and beautiful picture books during our morning time. We are already following the best preschool curriculum ever. When a child knows the sounds and names of all the letters and can write them in the air and/or sand, he’s ready for the next step of putting letters together to make words. My next post in this series will be all about making the leap from individual letters to forming words. And just for giggles…here’s the first words my 3 year old formed. Typical! Be sure you’re signed up for my email list to stay up to date and follow me on Instagram for behind-the-scenes access to our school days. I have read and re-read this a few times now. I go back and forth between feeling at peace with what I’m doing with my almost 4yo and 2yo, and then feeling like I need to do more. Just yesterday I was anxiously reading about different gentle preschool curriculums and trying to figure out if it was something I ought to do. I was definitely considering themed lessons on letters of the week and gathering all the materials and crafts and books… and then I re-read this AGAIN and was reminded why I love the Charlotte Mason way. Thank you so much for sharing this. Especially you’re “What’s missing?” section. Now, I DO love your box of letters from Michael’s… is that something they would still be carrying? What section would you find that in? Oh I’m so happy to hear that! I am sure that whatever you are doing is ENOUGH! 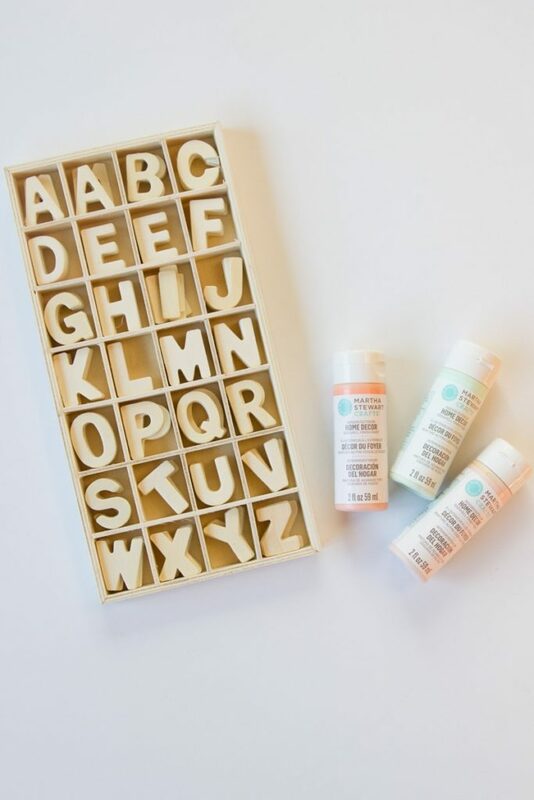 And yes, you can find the box of letters at Michael’s in the unfinished wood section for ~$9.99 and you can use a coupon to get it for just a couple of dollars! Can’t wait for your next post about sounding out words! This is seriously helping me a ton. Thank you for taking the time to do this!